Candidates who want to make their career in government field are going to appear for competitive exams may start their preparation from previous papers. So here model papers for all government exams are available. This page is going to be one stop destination for all old solved papers, model papers. 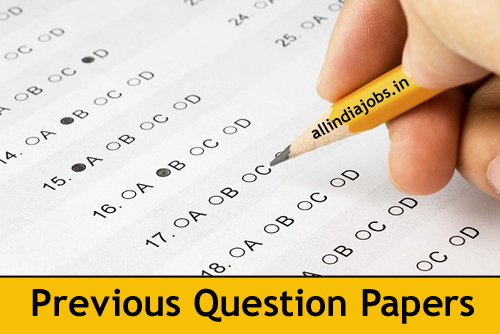 We update previous year question papers for all government jobs and entrance examinations. So candidates can download all previous papers for all examinations in a pdf format. With these model question papers, aspirants can get an objective for the preparation of all Government examinations. So aspirants can get an idea about time management, effective preparation, and proper planning before attending the examination. Old question papers vary according to the exam. Along with these previous papers, we will also provide syllabus and exam pattern. Candidates who are searching for old solved question papers for all Government exams are available on our website www.allindiajobs.in. Candidates can get various past question papers for APPSC, IOCL, ISRO, Karnataka TET, NPSC exams, entrance exams, Bank exams or any other competitive exams. The level of competition in today’s world is at its peak and therefore, to beat other aspirants, one not only requires academic knowledge, but also need to beat the score of others to qualify for the job and, for that a glance of previous year question papers of the Govt. exams are needed. Aspirants can also check for the solved papers and model papers provided on this page. Candidates can visit our website daily for continuous updates regarding previous year papers to help you prepare well for the exams. This is Sohail, requesting you to send me previous question paper to my mail Id. I really believe you are the greatest person in the world who have very kind heart to help others. please send the link to get the previous question papers for the post of security inspector and security officer in indiragandhi national tribal university amarkantak at the earliest please. Multi Tasking Staff (Peon, Sweeper, Ward Boy) previous papers. to my whatsapp or mail. total marks in this Pune Cantonment Board for clerk…. Can you please send me the last year question paper of pune cantonment board exam on my e-mail id ? Can you send me 10 years previous question papers for statical officer. Please send me previous exam papers of steno exam. Please send me the previous questions papers. Sir, please send me previous years exam paper . please send the link to get the previous question papers And syllbus for the post of MMRDA ACCOUNTENT the earliest please. Please send me the link to get the previous year papers for the of udc in icmr…. kindly send proper question type for maths,and english subject for SAIL jr.staff nurse exam 2018. Plz provide me with the previous exam paper for grade 4 of DHSFW. I need psc ICDD supervisor 10 years question papers in Bengali. pls send me.